You may not have heard the term before, but “dignity of risk” crops up again and again in childcare, aged care, disability services, and mental health practice. The concept is a simple one: that the right to take reasonable risks is essential to human life; that risk allows a person self-esteem, agency, and dignity. This concept is the basis for Australian Theatre for Young People’s new show, created in collaboration with Shopfront’s Harness Ensemble. 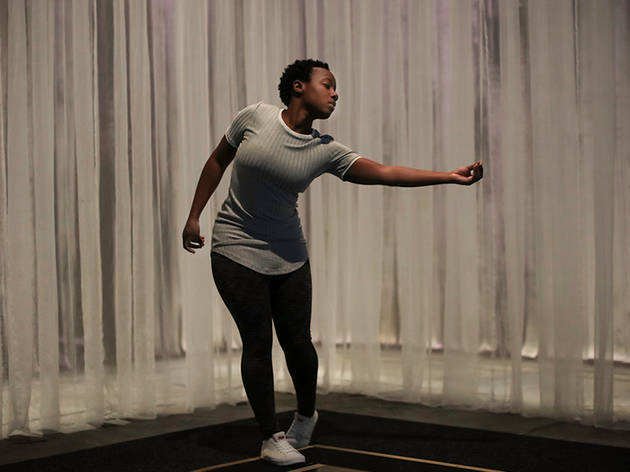 Dignity of Risk is a devised (created in the rehearsal room) performance that uses dance, movement, verbatim dialogue and short scenes to explore the ways that social perceptions and misconceptions can place a barrier between ourselves and the world. 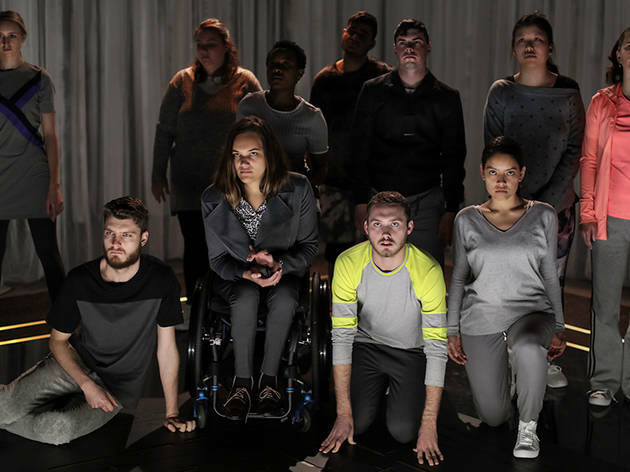 The ensemble of actors (Mathew Coslovi, Holly Craig, Teneile English, Caspar Hardaker, Riana Shakirra Head-Toussaint, Steve Konstantopoulos, Wendi Lanham, Briana Lowe, Sharleen Ndlovu, Jake Pafumi, and Dinda Timperon) work together to chart the intersections of race, gender, sexuality, appearance, disability, mental health, and speech that form their public identities – for better and worse. Drawing from their own memories, they share with us their experiences of fear and prejudice, suicidal ideation and daily microaggressions – but also their successes, their self-love, and their love for others. 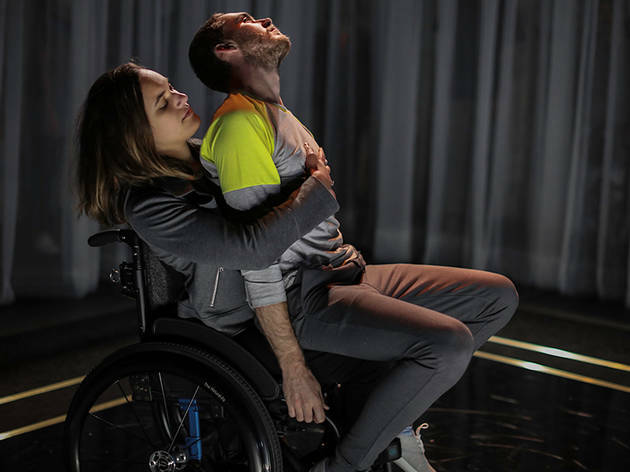 No actor on stage is ever reduced to a single story, or to any disability, class status, mental illness, or ‘label’ they may otherwise wear – this is not a study in identity politics. Rather, Dignity of Risk breaks past labels to find the universal: the human need to be seen by others as we see ourselves. Every actor dances; every actor jokes. They battle against their fears through movement; they describe themselves to us in their own terms. 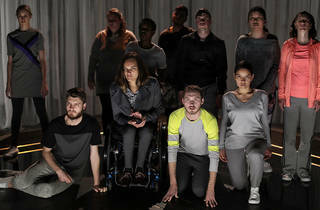 In one particularly clever scene, the company tries to line up in order of their own privilege and figure out whom in the group is the most disadvantaged. This playful but still impactful take on an entire genre of viral video quickly demonstrates how nuanced concepts like privilege and disadvantage really are. Margot Politis’ choreography is generous, simple, and actor-focused; she manages to turn an onstage rave to a Kanye West song into a stirring consideration of self-isolation and liberation. And when Riana Shakirra Head-Toussaint (whose self-possessed onstage persona is so full of charisma you’ll want to see her onstage more often) dances with Jake Pafumi, or Holly Craig dances alone, finally expressing herself in the way she feels most comfortable, interpretive dance feels both easy to understand and necessary as a storytelling device. The show is given an overall shape by director Natalie Rose (who, as a member of performance collective post, alongside Mish Grigor and Zoë Coombs Marr, is an expert in devised theatre), and dramaturg Jennifer Medway. They have structured the hourlong performance with care; confessionals and voice-over monologues are balanced with vital bursts of humour, dance, and conversation. The ensemble is so big that by the time the performance ends it feels like we’ve only just begun, but the time we do have is well worth it. Dignity of Risk doesn’t pull any punches: it discusses the ways that discrimination can lead to isolation, but it also celebrates self-worth and validation. This work is about the onstage company, but it’s for all of us. If you’ve ever struggled with not living up to our society’s ideal – or even its standard for ‘normal’ – you’ll find comfort, strength, and at least part of yourself in this performance.